Next week I am taking part in the Schoolhouse Review Crew Blog Hop. 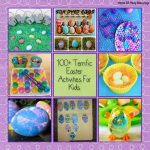 90 bloggers are participating, each choosing a topic to write about for the 5 days of the blog hop. 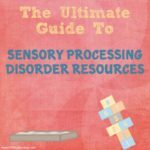 I have chosen the topic Sensory Processing Disorder because it is a topic that I have learned so much about over the last 5 years, something we have come so far on, and something I have not shared much about on the blog. 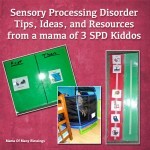 I am hoping that this series will bless anyone who is embarking on a scary path of a new Sensory Processing Disorder diagnosis or someone who thinks their children might have it I pray it gives them guidance, and helps them figure out what they need to do to help their child. 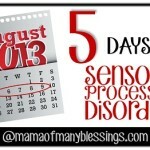 I was originally going to share a post with all 3 of my boys with SPD and their symptoms on the first day of the blog hop, but after I realized how long the post ended up I decided to split it up into 3 separate posts 1 for each of the boys share them before the blog hop and choosing another topic for the first day. Each of the boys symptoms are different when you look at the big picture, Dustin and Ethan have very similar personalities in certain areas life like being on the go constantly, and having no fear of any situation… even when they should :0 but they look nothing like each other in other areas. 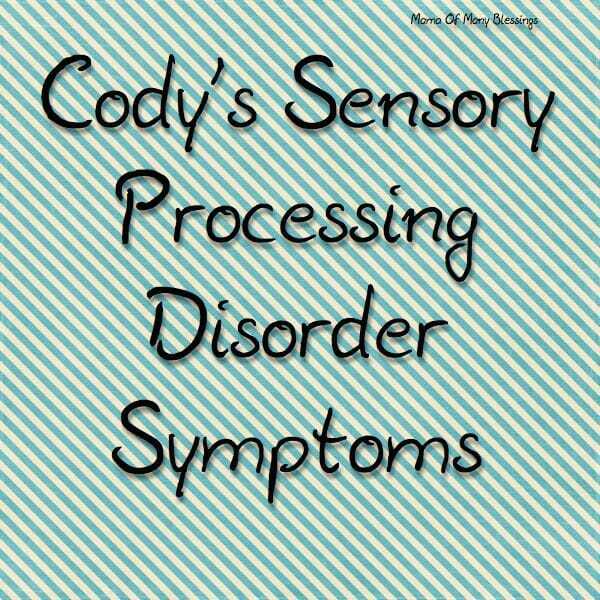 Cody is very different from both Dustin and Ethan calm, relaxed, kept to himself, and very quiet. Now before I go any further I have to say after raising 5 boys are just more active in general they love to climb, jump, and love taking things mom doesn’t want taken apart to try to fix them. After having a girl first I was blown away at how active my first son was compared to a girl and learned real quick to give him the physical activity he needed every day. 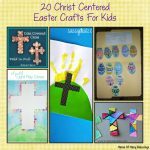 In todays society I feel parents rely to much on technology and instead of using them occasionally for entertainment they have turned into babysitters for parents children are spending way to much time inside sitting at a computer, I-Phone, or tablet. 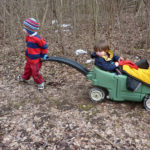 More parents need to let their children get their energy out (especially boys), explore the world around them and use their imaginations to play with toys, and even things they find around the yard. 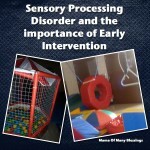 Today I am going to share Cody’s journey with Sensory Processing Disorder. 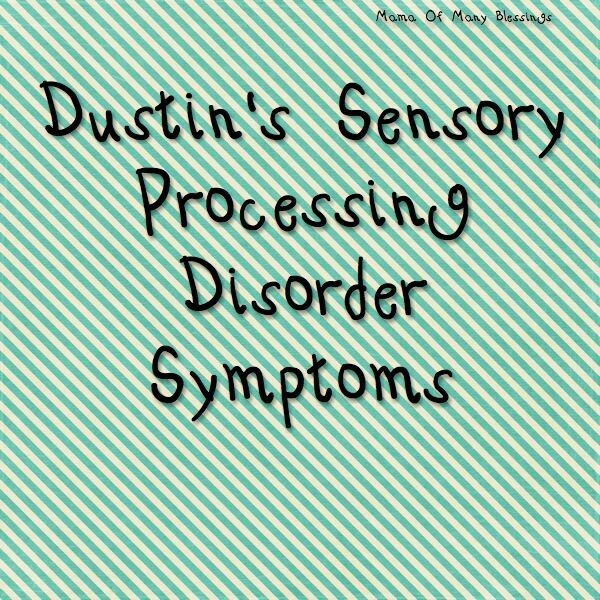 His journey and symptoms are the complete opposite from Dustin’s Sensory Processing Journey. Cody was my very sick kiddo for many years, he would chronically get pneumonia and be admitted into the hospital for sometimes a week in respratory distress. We went through just about every test available to find out what is wrong with this kiddo, there was even a Christmas that while everyone was putting the Christmas Decorations up while he just laid on the couch and watched, he looked VERY, VERY Sick and ended up having very bad pneumonia. After seeing a Pulmonologist in town who told us that this would be how he would spend the rest of his life (in and out of the hospital not able to breathe) I decided to go to the Children’s Hospital 2 1/2 hours away only to find out the doctors here in town were overmedicating him. After his diagnosis we found out he had VERY SEVERE allergies to nearly everything in the environment, and we needed to start him on allergy shots. After finally getting his health under control we started noticing that he was just not picking up on reading, spelling, or handwriting at all. We waited and waited because everyone told us some kids are just behind at picking up reading, but nothing ever happened he just became more frustrated that he was struggling reading. After a few years of intense reading, writing, and spelling practice with him 1 on 1 we decided it was time to go in and figure out what the problem with him was. At that time I wasn’t aware the local hospital that did a lot of the testing in the area was only allowed to give certain diagnosis because they diagnosed children for the public schools. 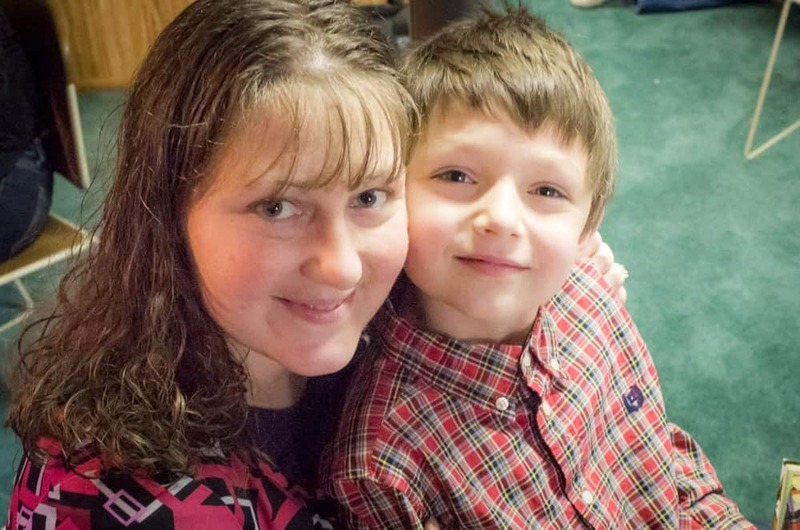 They did end up giving him a dyslexic and dysgraphia diagnosis, which led us to getting him a private tutor from a local company that is specialized in working with dyslexic kids. He was enrolled with the private tutor for about 8 months and I continued to work with him to the point that he was reading very fluently, handwriting was improving, and his spelling was slightly getting better as well. 1) He doesn’t understand sarcasm AT ALL!! If you told him it was raining cats and dogs he would ask where the cats and dogs are. 2) He is quiet, doesn’t like to go in big groups or with people he doesn’t know stays away from groups of people and prefers playing by himself. 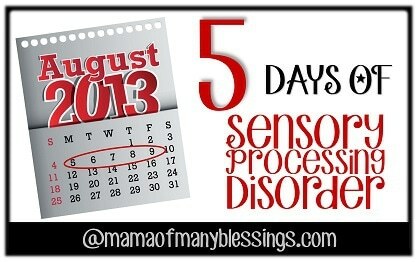 3) He avoids many different sensory interactions because they are things he cannot get over. 4) He is really a genius in the area of video games and could tell you anything about any level on any game he has played step by step, even after many years since playing the game. Is very picky about the textures he will touch and will get very upset if his hands get messy, he had a very difficult time making out paper mache planets because he wanted to wash his hands so badly. Has poor coordination and had a very difficult time learning to write well, he struggles in sports because of his coordination as well. 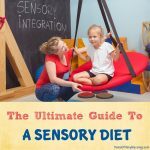 He will only eat certain texture foods and resists trying new foods. Becomes fearful or anxious at the slightest touch. Even as a baby he did not like to be cuddled like the other kids. Likes to wear long sleeve shirt and pants year round. 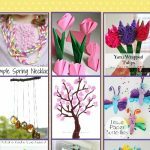 Has difficulty with fine motor tasks like buttoning, zipping, and tying. May be a messy dresser; looks disheveled, does not notice pants are twisted, shirt is half un tucked, shoes are untied, one pant leg is up and one is down, etc. Looses balance frequently and may appear clumsy. Never crawled as a baby. Difficulty catching himself if falling. 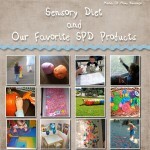 Has poor body awareness; bumps into things, knocks things over, trips, and/or appears clumsy. 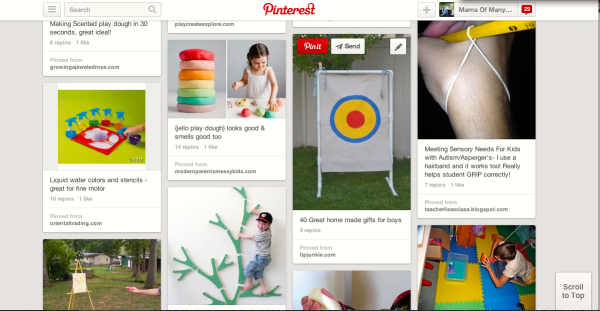 Poor gross motor skills; jumping, catching a ball, jumping jacks, climbing a ladder etc. Frequently falls on floor intentionally. Seems to do everything with too much force; i.e., walking, slamming doors, pressing things too hard, slamming objects down. Difficulty regulating pressure when writing/drawing; may be too light to see or so hard the tip of writing utensil breaks-Has difficulty understanding what was said. 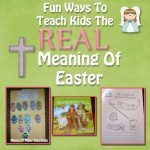 Makes reversals in words or letters when copying, or reads words backwards; i.e., “was” for “saw” and “no” for “on” after first grade-has difficulty telling the difference between similar printed letters or figures; i.e., p & q, b & d, + and x, or square and rectangle. Has a hard time seeing the “big picture”; i.e., focuses on the details or patterns within the picture. Often loses place when copying from a book or the chalkboard. 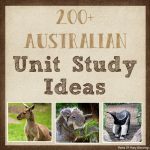 Tends to write at a slant (up or down hill) on a page. Difficulty judging spatial relationships in the environment; i.e., bumps into objects/people or missteps on curbs and stairs. If not understood, has difficulty re-phrasing; may get frustrated, angry, and give up. Difficulty reading, especially out loud (is also dyslexic)-prefers playing by self with objects or toys rather than with people. Does not interact reciprocally with peers or adults; hard to have a “meaningful” two-way conversation. Unable to regulate thirst, always thirsty. 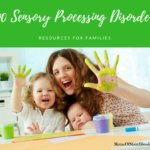 We have found many great ways to help the kids symptoms and to make life for everyone as smooth as possible, stop over during our 5 Days of Sensory Processing Disorder series for all the great tips and ideas we have used. 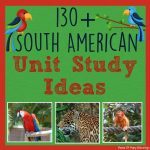 Next week I will be sharing for 5 days as part of the Schoolhouse Review Crew Blog Hop about different topics on SPD be sure to follow along so you won’t miss any of those posts. The first post will be on August 5th, and the crew will have 90 bloggers sharing about different topics you won’t want to miss it. 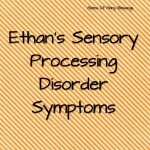 Tomorrow I will be sharing Ethan’s Journey with sensory processing disorder so be sure to stop back and read about kiddo that struggles the most with the disorder and actually the one that lead us to discovering about SPD in the first place. 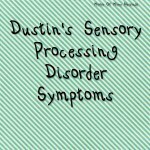 Also stop over and read about Dustin’s journey with sensory processing disorder, that I shared about yesterday along with our journey with ADHD meds and reasons for not taking them anymore.